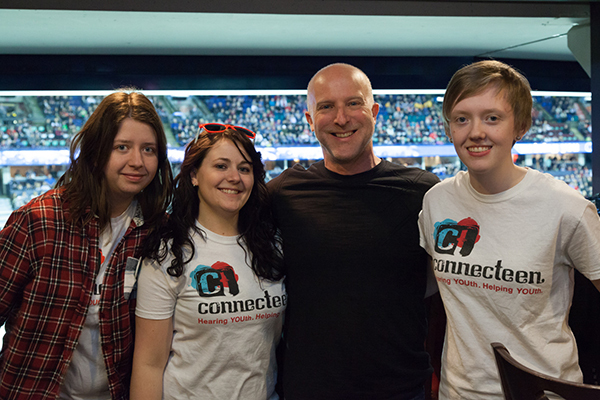 Robyn Romano (middle left) at our 2015 Calgary Hitmen game is support of ConnecTeen. When Robyn Romano, Contact Centre Supervisor at Distress Centre, thinks about what drove her to pursue social work, she recalls back to when her mother was in palliative care and she observed the home care nurses who cared for her. Initially, she thought she wanted to work in counselling. In her six years at Distress Centre, she has held almost every role imaginable. She began as a practicum student while working towards her Social Work Diploma, followed by stints as a STEP summer student, crisis-line volunteer, relief staff and various part-time contract positions. In the process, she also obtained her Bachelor’s degree in Social Work before becoming full-time staff in 2010. Before coming into her current position she was a Volunteer Team Lead. It was her responsibility to look at the overall volunteer experience and ensure that volunteers feel supported and satisfied in the work they are doing. In this time she also oversaw ConnecTeen, our youth program. For several months she also covered the role of Senior Manager of the Contact Centre while Jerilyn Dressler filled in for Joan Roy, our Executive Director, who was on leave until November 2015. This prepared her for her new position as Contact Centre Supervisor, which she came into in January 2016. Her role is to oversee the functioning and every day operations of our 24-hour contact centre. She also sits on our United Way Workplace Campaign committee, where she plans events and activities to support the campaign and raise funds for United Way, one of our core funders. In between her demanding work schedule, Robyn has somehow found time to enroll herself in a Master’s of Social Work program, specializing in Leadership in Human Services. Prior to coming to Distress Centre, Robyn says she wasn’t familiar with the program, but credits it as an invaluable tool she can use to carry out her day-to-day duties more effectively. Robyn is already identifying ways to integrate school and work. For instance, she based one of her recent assignments on a provincial-roll out of our 211-program. Robyn says the biggest benefit of the program is that she can use her studies to strengthen the work she is doing at Distress Centre. Following the completion of her Master’s, Robyn has plans to further her education even more by getting a Certificate in Marketing. Within the next 3-5 years, Robyn hopes to continue her work at Distress Centre and continue to advance her career. She hopes that the knowledge she obtains through her Master’s program and later education in Marketing, will allow her to grow into a higher leadership role within the organization. Further down the road, Robyn hopes to grow her non-profit experience into the corporate sector, specifically within the area Community Investment. Knowing the needs of non-profits, Robyn thinks corporations could benefit from an inside lens. Yes, an organization needs money to provide its service but according to Robyn, just giving money will not bring about social change. It’s the role of Community Investment to go a step beyond and provide tools to help be a part of that social change. What exactly the corporate sector can do to take their giving to the next step is something Robyn would love to explore. But in the meantime, Robyn jokes that she’s just trying to get enough sleep to get through her busy day. Interested in working at Distress Centre? Check out our Careers page for opportunities. Or volunteer with us! Many of our staff members, including Robyn, began as volunteers.